Verify that you have the correct JDK. You can check it by opening command prompt (press windows key and write cmd ). In the command prompt type javac -version , this will show the current version of JDK installed on your matching or an error* if Java is missing. If the JDK is not available or the version is lower than 1.8, download the Java SE Development Kit 8. Download the latest Android Studio. Launch the downloaded .exe file. After installation completes, open Android Studio from the shortcut that has been made on Desktop during the installation process. When you open Android Studio for first time, it may ask you to copy your previous settings, but as it is your first time you can simply choose not to copy anything. 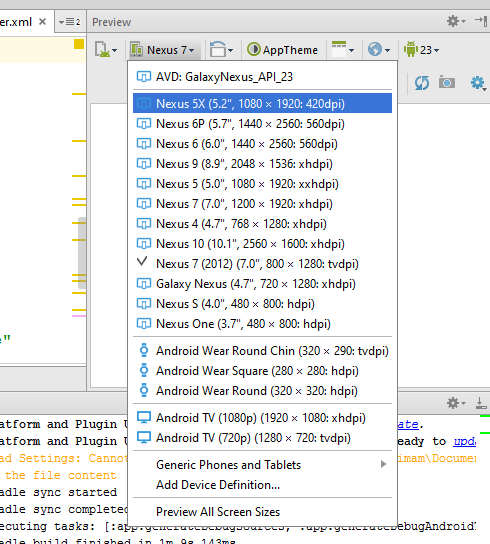 Then Android Studio ask to download the required API's to develop Android apps. Download those, after downloading the IDE will open and you will be able to write your first app. Launch the downloaded .dmg file. Unzip/extract Android Studio in a specific folder. Open terminal and go the path where you have extracted the Android Studio. (Then, use cd command to go inside the Android Studio folder.) After going in we need to go inside bin folder so again,use command cd bin and enter. Now we need to change the mod of our required file i.e studio.sh to do so enter command sudo chmod 777 -R studio.sh , press enter and write your password(if any) and enter. (Also you can see the list of files present inside bin by command ls .). When you run above command Android Studio launch for first time, it may ask you to copy your previous settings, but as it is your first time you can simply choose not to copy anything. You may encounter "unable to run mksdcard SDK tool" when you are installing android studio in 64 bit ubuntu os because studio requires some 32 binaries. To overcome this error finish and close Android Studio & go to terminal and run sudo apt-get install lib32z1 lib32ncurses5 lib32bz2-1.0 lib32stdc++6 . Once installation is completed for these binaries again go back to step 6 and resume installation process. If you have already installed JDK and still getting then make sure you have set JAVA_HOME in your System Variables . You can check this answer on how to setup one. There are, however, known stability issues in Android Studio on Mac when using JDK 1.8. Until these issues are resolved, you can improve stability by downgrading your JDK to an older version (but no lower than JDK 1.6). While the Android Studio download completes, verify which version of the JDK you have: open a command line and type javac -version . If the JDK is not available or the version is lower than 1.8, download the Java SE Development Kit 8. 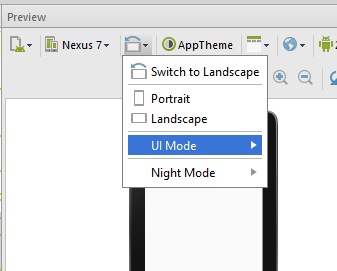 There is a preview panel at the right of the android studio. In thispanel there is a button with device name with which you are previewing the UI of your app like this . Click on small dropdown indicator of this and a floating panel will appear with all the predefined devices. You can select any of them to preview your App UI with different devices mentioning their screen sizes. Clicking to its dropdown a floating panel will appear with some options like portrait , landscape etc. select one of them to preview in different orientations. The option to preview all screen sizes is not available from Android Studio 2.2 Beta 2. However, you can resize the preview screen to see how your layout would look on different screen sizes, as shown in the attached. and others, to map the shortcuts to the wanted tool ones.